HOW SATURN TRANSIT 2017 WILL AFFECT EACH NAKSHATRA (CONSTELLATIONS)! Once in 30 years, Saturn moves all the 12 Rasi of Zodiac. It will stay 2.5 years in each house before moving into next Sign. 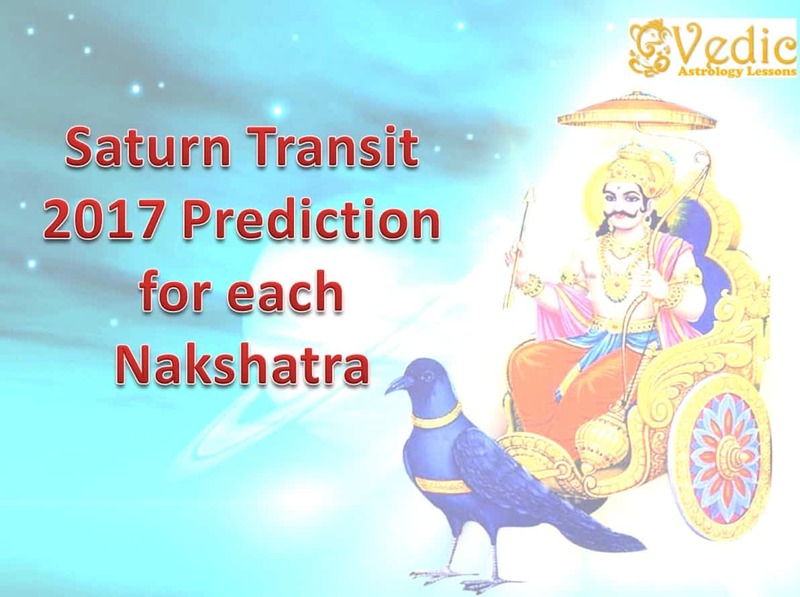 During this period effect of Saturn Transit 2017 effects 27 Nakshatras (Constellation) will be different. Th, s will impact horoscope in Business, Career, Love, Marriage, Education, Relationship, Health, and Finance. As per Thirukanitha Panchangam, the slow moving planet Saturn leaves Scorpio and moves into Sagittarius sign on 26th January 2017 at 06:13 PM. Saturn stays in Sagittarius sign year 2017, 2018, 2019 and up to mid of January 2020. The transition of Saturn will bring moderate results for the persons born under the Ashwini Nakshatra. While Saturn will be present in the 9th House for your Birth Sign, The South Star (Ketu) transits from your 11th House to your 10th House. This will bring good name and fame for you and your popularity in your society will rise. Any delayed transactions with the government will be completed in a good way. Any problems in your family will start to reduce. People in joint families will experience some relief. Your fortunes will also increase. Any obstacles in giving and receiving longstanding dues will disappear. Your money stuck elsewhere will return to you gradually. Your income will increase. At long last, you will get time to intake your food according to your wishes. Your siblings will have celebratory occasions in their family. Your interest in learning new things will increase. Your family discord will reduce and unity will grow among the family members. New people will enter your fold. For some people, opportunities for buying new house, vehicles or land will arise naturally. Any misunderstandings in the family matters will lessen. New job opportunities and unexpected promotions will arise. Your co-workers will be kind towards you. Any couples living at separate places due to work will get the chance of living together. Childless couples will be granted their wishes. The transition of Saturn will bring good outcome to this Nakshatra born persons. You will hear expected results. You will be energetic your actions and clever in speech. Your monetary situation will also become good. Your interest in new things will result in new efforts that are successful. Physical and mental hardships will disappear and your happiness will surge. Your income will rise according to your hard work; at the same time, your spending will increase due to celebratory occasions in the family. Your documents, ornaments, and things under debt will return to you. You will get seats in your preferred colleges and courses. Your mother will shower her love and support for you. Your siblings who had some misunderstanding with you will return to your fold. You will have the prospect of buying new house and vehicles. You will participate in new festivities and occasions, while your mind loves to indulge in these activities. For some, your job prospects look better. But for any reason, do not leave your job, even if your current position is unsatisfactory. Do not try for another job or career now. Your love story will be a happy one. Any longstanding celebrations will take place. For some, this is the time for new children. Your court struggles will still stand. Your debts will also keep increasing beyond measure. This Saturn transition will be beneficial for you. The presence of Sun God in 5th House and Saturn in your 9th position will reap profits for you. Your unanswered prayers will be answered by your Family deity and favorite deity. Your place in the society will rise. You will be dynamic leaving aside your old, lethargic self. Festive occasions will take place. Your family will welcome new members. Their happiness will also increase. Not only your court cases, but even your enemies will surrender to you. Those who had left you will return to you. Childless couples will beget children. Children will bring good luck to you. Your interest and talent in learning new things will increase. Your immunity will surge and any disease will not affect you long. Your career will also see an upturn. Unexpected trouble due to workers might arise and disappear. Your romantic interests will be joyful and pleasant. Prospects of buying new vehicles, houses or plots will arise along with your loans. Chances of going abroad are high. You should be careful in share market investments. You should take care of your spouse’s health. Money flow will be quite good. You will gain unexpected benefits due to others. You will get unpredicted gifts and degrees. Be careful while traveling. Don’t take unnecessary loans as this will result in loss of mental peace. You will get your pay and fame right according to your efforts. Though you might face lots of roaming you will gain from your efforts. You might be separated from your close relatives. Your employers will be supportive of you, but your co-workers might cause some unpleasantness. During this period, your expected news might be delayed but will be eventually favorable. You will be active and energetic. Your standing in the society will rise slightly. Your skillful speech will serve you well. Your anticipated monetary returns will come in slowly in a gradual manner. Your new exertions will be profitable. You should not give loans needlessly. For some, there are gains in terms of clothes or ornaments. Your mother’s illness will abate or go away. Your siblings will be supportive of you. Opportunities for buying properties or vehicles will arise. You will experience frequent traveling and roaming, but they will result in success. Rumors about you will abound during this time. Your romantic interests will show lessened happiness. You will gain new friends in new places. You will experience some bitterness from close relatives. Dealings expected by you will be moderately fruitful. You should try to be cheerful and active all the time. You should try to finish your work as and when they arrive. Festive occasions and comfortable life will come to you later on. This is the time for you to work hard effectively in the right areas and shine. Do not interfere in other’s life and take care of your own business for a successful career. Be careful while lending and borrowing money, only on basis of need. Your status in the society will rise. You should learn to live in peace with everyone. You will be participating in many parties and events and you might face some unwelcome distress there. New relations will come into your life. Celebrations will take place in your siblings’ lives. Love affairs will be satisfactory. For some, your love will blossom and marriage will take place. Past disputes with your co-workers will get solved and your enthusiasm will swing up. The events which were stalled for so long in your life will start taking place slowly. Domestic problems will get solved smoothly after a long hard struggle. Any damages done to your name and status in society will be recovered slowly. Tone down gossiping and keep working hard. Shake off your laziness and be active. Money flow will be moderate. Your money given as loans will come back gradually. Your father’s health will improve. Your siblings will be beneficial to you. New relations will come into your life, producing happiness. Some may get the chance of buying new clothes and ornaments. Prospects of acquiring new house, land or vehicles arise. You will need to invest heavily in your profession. Employer – employee relationship will be good. A few workers might cause some trouble for you. Though you might face some competition in your business, you will get profits. Lord Saturn is partially beneficial to your House. Longstanding events will start taking place in your life. Though there might be a long hard struggle, success will come for sure. Your efforts will be successful. Your name, income, and status will rise. Expected news will be positive. Some unexpected trouble may arise from your sibling quarter and disappear. Help will come from surprising places. Do not concern yourself with the business of other lives. Borrowing and lending will be successful. Opportunities for buying land, vehicles or houses come up. Be careful in your work. Don’t give up your current job for any reason. Your love interests will be joyful. Children will prove surprisingly beneficial to you. Take care of your health. Your interest in traveling will increase. Both expected and unexpected news will be positive. Your fame in society will rise. Unnecessary travel and roaming will increase. Enemies become friends and friends turn into enemies. You will start acting with renewed vigor and interest. Your efforts will be fruitful. Even if your new exertions face some difficulty, in the beginning, you will achieve success in the end. You will act in a brave and intelligent way, carving out success with your timely actions. Be careful of your mom’s health. People born under this nakshatra will beget unexpected financial gains and things. You will get the opportunity for higher studies and therefore progress in your life. Your siblings will be helpful. Your friends will be supportive of you. Your love interests will be joyful. Take good care of your health. Accidents and surgeries can happen. You will get loans from the expected quarters. Your loans will increase, resulting in higher interests to pay. Prospects of traveling to foreign places are in the cards. Change in the job is likely and you will be energetic. You will participate in competitions and struggle to succeed. Promotions will come to you and change of location due to your job is likely. The relationship between husband and wife will be smooth. Your employers might cause unnecessary trouble for you. Rumors about you are likely to abound during this period. Family problems will go down and you will get the right pay for your hard work. Your income will rise according to your merit. Any troubling disease will reduce in its intensity. During this period you might experience unwanted fears and travel. Your basic needs will be met. Success in competitions is guaranteed. You will get a job after your studies/training. Opportunities arise. Lord Saturn will cause you unnecessary roaming. Your health will be consequently affected. Expected success will be delayed. For some, change of location is in the cards. You might face some hurdles in your efforts. Competition and conflicts will arise and disappear. Your siblings will be a cause for grief. Your close relatives might leave you. Self-employed and people in small businesses must be careful. You will learn to drive new vehicles. The presence of the South Star in your 7, 6 and 5 Houses will be beneficial in one way and disadvantageous in another way. Any court case will be likely to stretch. Your workers might cause you some unpleasantness. You might have some fights and conflicts in your love life. Unnecessary problems will arise in your work. You will obtain your passport and visa after crossing some obstacles. Your interest in learning new things will rise. Your efforts will be rewarded. Your younger siblings will be surprisingly helpful. Frequent travel to nearby places will be required, which will be fruitful. The confusion and fears present in your heart will disappear. You will have a clear mind now. You must have been living a mechanical life till now. The times are changing and people will start realizing your value and importance. Your talents will be appreciated and utilized correctly. The husband-wife relationship will be smooth. Long overdue celebrations in the family will start taking place. You will be energetic and cheerful. You will try to finish your work without any impediment of the mind. You will receive new clothes and ornaments. Childless couples will beget children. The presence of Lord Saturn in your 4th House will bring in modest results. You might have to invest in a new house, properties, and vehicles. Your mother’s health needs your attention. Your romantic life will be moderate. Your prayers for your children will have good results. The money lent to others will return slowly. Your thoughts and aspirations will be fulfilled. Long overdue celebrations will start taking place in your life. Your mother will be unexpectedly beneficial to you. Prospects of buying new lands, houses, vehicles and household devices arise. You will receive promotions in your job. You will get the chance of going abroad and pursue higher studies. Politics and self-employment will be profitable. You will be cheerful all the time. You will work hard for gaining name and fame in your career. Your siblings might cause unnecessary trouble for you. Your elder siblings will be caring towards you. Do not undertake nay unneeded activities. Your parents’ health needs your attention. Be careful while driving or traveling. Be alert when handling ornaments and documents. Do not undertake responsibility for any bail. Opportunities for starting new businesses will arise. You will be always cheerful and energetic. Long overdue celebrations like marriage will start taking place in your life. Court cases will keep stretching on. Unnecessary problems will arise and disappear. You will get the chance to invest in manufacture related businesses. Your romantic interests will be joyful. The relationship between husband-wife will be smooth. Be alert while traveling in vehicles. Happy events will take place in your siblings’ lives. Obstacles will occur while traveling. Change of job is likely. Problems in land dealings and ancestral wealth will stretch on. Your employees might cause some trouble. Difficulty in obtaining the right payment for your efforts will rise and disappear. Your efforts are likely to succeed. The government or higher officials will help you unexpectedly in your endeavors. You will gain help unexpectedly from people speaking other tongues. Your elder siblings will have celebrations taking place in their lives. Their love and support will be present for you. You might face obstacles to travel to foreign places. You might get chances to study further or start new businesses. Businesses in the manufacture, small businesses will be profitable. Your career will advance, bringing in expected income. Any misunderstanding with your friends will be resolved and friendships renewed. Your love story will see a happy ending in marriage, for some. Child boon will be granted for the childless. Your close relatives will be caring and supportive of you. The obstacles placed in your work life by Lord Saturn will be removed by Him and you will get a good job with the expected pay. Money flow will be good. Your court cases will unexpectedly end in your favor. You will receive loans from the expected places. Lord Saturn will create hurdles in your search for your soul mate, but He will bless you with a good marriage. When Lord Saturn is present in the 2nd House, He will give you moderate blessings resulting in a few celebratory occasions. Matters of love, marriage, and children will be joyous to your heart. Your children will have some celebratory events happening in their life. Do not lend unnecessarily to anyone. Do not leave your job for any reason. Your heart will always be uplifted for reasons unknown to you. Money flow will be good. Trips and pilgrimages will bring happiness to you. Frequent visits to the temples occur. People in higher positions will be friendly towards you. Any issues with your passport and visa will be resolved. Change in the job is likely. Obstacles to foreign travel will disappear. The self-employed should be careful. Avoid needless investments. The presence of Lord Saturn in Anusha Nakshatra will bring in money and properties. Change in location or house is likely. Expected news will be delayed, but will be positive. New efforts require your caution and attention. Manufacturing businesses will be profitable. Small businesses, self-employed businesses, and roadside businesses will be profitable. Money flow will be good. Lord Saturn will make you work with energy and vigor. Unexpected monetary gains are possible. You will receive effects from your spousal side. Your father’s health needs attention. Unsettled things like money, items will make way towards you gradually. Your interest in learning new things increases. The presence of Lord Saturn in your nakshatra along with the South Star in your 2nd and 3rd Houses will result in unexpected help. Your efforts will be partially successful. Frequent traveling and roaming are expected, which will be fruitful. Strangers will be helpful. Romantic interests will suffer. Rumors about you will abound. Don’t waste your time and work hard for success in your work. Small businesses and roadside businesses will be profitable. Stock markets will be favorable. The husband-wife relationship will be happy and content. Your children will cause unnecessary expenditure. Any obstacles in pursuing higher studies will go away. You will get good courses. Your misunderstandings with your relations will be resolved and you will unite with them. Hurdles in foreign travel will disappear. Your relations with outsiders will be smooth. For some, you will face the prospect of voluntary retirement or leave your job. Your father will be caring and supportive of you. Your romantic interests will be joyous. You will see surprising inbound wealth and articles. For some, ancestral properties or unexpected money from your spousal side will be seen. Be alert in your dealings with the government. Respect and follow the rules and regulations. Do not lend unnecessarily or sign bails. Unneeded expenditure due to health and other reasons will plague you. So, prayers to your family deity and your favorite deity are important during these times. You will face poor pay for your hard work during this period. You will face troubles due to your workers. The husband-wife relationship will be rocky with conflicts and misunderstandings. Obstacles in pursuing higher studies will disappear and you will get the chance to take up your desired courses in your favorite colleges and schools. You will obtain good marks. You will get the courage and determination to undertake anything. This is the right time to invest in new properties, houses, and vehicles. Your mother will be unexpectedly lucky for you. Manufacturing businesses will be profitable. Your work situation will be unsatisfactory. Do not leave the present job and try for a new one in haste. Your siblings will have celebratory occasions in their lives and you will benefit from them. You might face trouble in begetting children. You will not be interested in partying. Stock markets will not be favorable. Politicians will be moderately successful. Your efforts will be successful. Expected news will be positive in their outcome. Small businesses, roadside businesses, telecommunications, transport fields will be profitable for you. Your siblings will be supportive of you. For some, change of house or location is in the cards. Some will see a chance of selling off old properties and investing in new ones. Unexpected friendships will form, which will be helpful. Money flow will be good. Your deftness in speech will increase. Lost properties, money and articles will return to your hands. You will get the opportunity of traveling abroad due to your work. Your courage and self-confidence will increase. Your chances of pursuing higher studies will be high. You will get the opportunity for self-employment, new businesses, and partnership. Those pursuing higher studies should be attentive. Take care of your health, as your immunity is reduced. Court cases will not be favorable. Be careful regarding your enemies. Be cautious in investing in stock markets. Love affairs will bring moderate joy. Long overdue marriages and celebrations will start taking place. Moderate profits can be expected from import and export businesses. Your friends will be a cause for joy and help.